We are always extremely grateful when we receive kind letters and emails from our clients. Please find some extracts below. Thank you so much for looking after Arthur. He seemed very happy when we got back and have no hesitation in using your services again. So nice to have found you. Ruby has lovely walks three times each week with Jackie. It is a brilliant service.....I couldn't do without Jackie's help. Poppy really enjoys the Ark. She is looking forward to her next visit. Our four month old Spanish Water Dog, Pepe visited Holiday Ark for the weekend. He had a fab time and Jackie is great, really put us at ease about leaving him. Just to say the hugest of thank-you’s for taking such wonderful care of Sadie whilst we were away. We knew that she was being so much love and care that we were so happy & relaxed! Sadie will definitely be coming to visit again in the future! Thank you very much for looking after Tony and Skipper for us. They look very happy and well, which again, I thank you for. 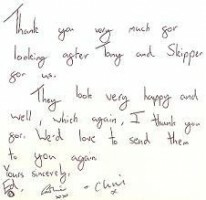 We''d love to send them to you again. 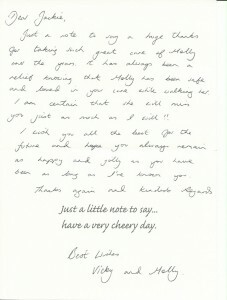 Thank you for all your hard work and care of Molly during 2010. We greatly appreciate your work. Looking forward to 2011. Jackie has looked after our cats many times whilst we've been away. She does a very good job and the cats, goldfish and toirtoises are always in excellent condition on our return. I have confidence in Jackie and it is a relief to know she is keeping an eye on our much loved felines. Thank you so much for helping to ease us painlessly into dog ownership. Many thanks for your help looking after Zola. We really appreciate the TLC you give her. Thank you for being such a reliable friend to Barney. A special thank you for taking such good care of me!! I hope Max is now putting his paws up!! Thank you so much for all the care you give to Eddie. I am very pleased with the service you provice and both you and Nicky are just such a great help and we know Eddie is more than happy with his lovely walks. 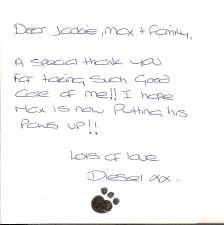 Thanks again for looking after Max and Kissy. It was great to be able to rely on you to keep an eye on things while I was away and good to come home to two contented cats. I'm happy to recommend Holiday Ark. Florence looks like she is having fun. Florence loves her walks with you and Nicky. We just wanted to thank you for looking after Decker so well last week. He seemed fine when we returned last night. I hope he didn't have too many accidents! Many thanks. We wish to thank you so much for all the help you’ve given us. Your service has always been first class and it has been so nice to be able to relax when we have been away knowing that Sviffen and Missan have been in good hands. Thank you. Many thanks for the pictures, I can see she is well loved and has a great time with you whilst dog walking. Thank you so much for your care over the few years we've know you. I can't think of a better person to have cared for Tabby, our cat, whilst we were away. Just wanted to say a BIG thank you for all your help with Zola since she was 6 months old. We have really appreciated your flexibility and high level of service you have provided over the years. Your help with Monty is much appreciated, the service you provide is absolutely excellent! Monty, I know, looks forward to you pulling up and his lovely walks. We are very grateful to you. Thank you so much for looking after our cat, Ditzy. It was great to know she was in good hands whilst we were away. She is looking forward to seeing you again. I just just wanted to send a thank you again for your cat sitting service. Excellent as always. Thank you for caring for Missy so well, she seemed very happy and content when we returned. We'll definitely book with you again in future, it's a relief to have found someone reliable to look after our cat at home whenever we go away. Home now to happy bonny cats. You are a wonderful person to be able to rely on. Have a lovely summer holiday! Thanks for all the fun dog walks. Izzy will miss you and all her friends. ..... and returned to two very well fed and happy kitties. ..... it's testament to the wonderful service you provide. This is my Bowseypup, after lovely Jackie has taken him for walkies, he is so relaxed & happy (& tired) when I get home from work & he is so excited to see her, I wouldn't ask just 'anyone' to care for him & we can't recommend her highly enough. She is fantastic!! Jackie has looked after our house rabbit Mary Lou on a number of occasions now and we really couldn't imagine anyone looking fter her as well as Jackie has. Mary Lou always comes back to us in great condition, happy and healthy. 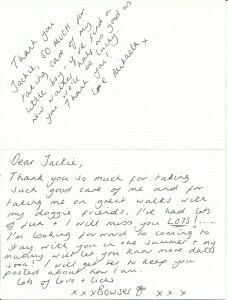 Jackie is incredibly personable and clearly loves the animals in her care as much as their owners. Furthermore, Jackie has gone above and beyond for us and really got us out of a tight spot. After Christmas I had booked a taxi to take me to collect Mary Lou but the estate was not big enough for her cage. Jackie instead delivered the cage back to us, following in her van. Really above and beyond. In my experience, Jackie gives exemplary sevice and I couldn't imagine leaving our pet with anyone else. Jackie has been looking after Billy for walkies a few times a week since he was 3 months old - he is now 18 months old. He also stayed with her for an overnight stay and enjoyed that very much and was not stressed at all when he came home (it was the first time we had left him). 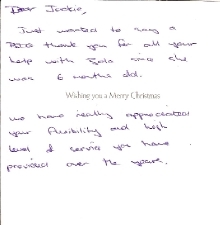 Jackie is alway reliable flexible and kind - I have valued her services and will miss her (so will Billy). Jackie offers a very professional animal sitting service. She looked after our lovely rabbits Bramble and Thumper many times before we moved to Cambridgeshire. We were delighted to hear that she was able to look after our new rabbits Marley and Tigga when we returned 4 years later. We would recommend Jackie to anyone looking for a professional, caring animal boarding service. My wife and I are very gratefuyl to have found Holiday Ark. They have taken fantastic care of our dearest rabbits during the years. We are very happy with their service. We are always at ease knowing that they were with you whilst we were away. Just wanted to send a thank you again for your services. Excellent as always. We had a great time and thank you for the pics! Thank you so much for looking after Evan and he is on very good form! We have boarded our three rabbits with you before and would be delighted if you were able to take them again. Thanks Jackie. Sylvie looks really happy. Thanks once again for taking such good care of her. Thank you so much for taking care of our cats Elsa and Smokey for us. They weren't at all bothered to see us when we got back which I take as a very good sign that they had full stomachs and enjoyed their fuss. Thank you so much ~ I wish I could export you west. Having you look after Monty and Bailey has relieved me of the biggest pressure. I don't know what I would have done without you. Thank you for your kindness, flexibility and professionalism with the little fellas ~ they will miss you.